(10/12/07 - HOUSTON) - Longtime Houston Astros radio announcer and ASA Member Milo Hamilton is back home after spending a week in a Houston hospital for treatment after a heart attack. The discharge of the 80-year-old Hall-of-Fame broadcaster comes from Houston radio station KTRH, which is the Astros flagship station. Hamilton began experiencing chest pains on Sunday, October 7, at lunch and went to an emergency room where doctors discovered a clogged coronary artery. He underwent an angioplasty and had a stent implanted. The heart attack postponed hip replacement surgery that had been scheduled for last Monday. That surgery will likely be delayed for 6-12 weeks. Hamilton has been calling major league games since 1953 and has been with the Astros since 1985. He began working only home games in 2006. 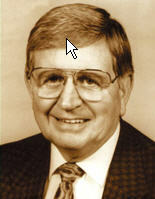 Hamilton was inducted into the broadcasters' wing of the Baseball Hall of Fame in 1992.